Over the course of the last 15 years, my work with the Hawaiian Islands Land Trust has allowed me to connect with a multitude of people with stories, knowledge, and skills to share. These gifts of ike have helped to shape how we approach land conservation in Hawaii, more specifically, how we malama the wahi pana that is Waihee Coastal Dunes and Wetlands Refuge. Beginning in the new year, and continuing over the course of the next two to three years, I will embark on a serial blog project — akin to historians of the past who published their findings in various Hawaii newspapers — to share the history, biology, geology, and cultural myths and legends of Waihee and express gratitude for the many people who have contributed to the restoration at Waihee over the years. The blog will be a journey stretching back 1.6 million years, when the volcano that we now call Puu Kukui, or the West Maui Mountains, finished its building phase, and will end with some reflections on our hopes for the future of this wahi pana. In between we will share what we know, and what we have learned from our own studies, from archaeologists, kupuna, former cowboys, books, and newspapers. We hope that this collection of stories will serve as a resource for current and future generations, maintaining access to the vast ike we’ve collected over the years within a single source. Over time, we hope that future generations will add to the story or inform our hypotheses as our current efforts come to fruition. 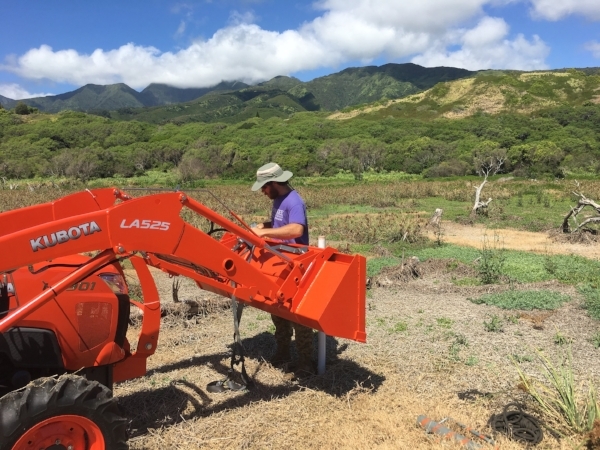 This project will be a concise history, telling the story of Waihee, and what makes it a wahi pana, a place of legends, stories, and myths and a place where people have put their hands into the soil bringing life to the land for millennia. So, it is with deep gratitude, that I ask you to follow me on this journey and to share your own recollections, hopes, dreams, or just mana’o about this special place. At the end of the journey, we hope you will understand why we like to say so often, “He ali’i ka ‘aina, he kaua ke kanaka.” The land is the chief, and the people are its servants. Blog Bonus! See for yourself what it’s like to wake up in Waihee with this sunrise time lapse. What’s your happy place? If you are lucky enough to get there in person, how do you cherish and protect it? How do you honor its unconditional contributions to your well-being and ensure that it continues to thrive? In my new position with the Hawaiian Islands Trust, I face these questions every day. At HILT, our mission is to protect the lands that sustain us, for generations. I joined HILT with simple orders: advance this mission. Protect the happy places that have provided, and still promise, an abundance and resilience for the communities that collectively care for them. To understand that important mission, it helps to know the Waihee Coastal Dunes and Wetlands Refuge, my new favorite happy place. HILT manages and stewards public access to this 277-acre treasure on Maui’s North Shore so that others may too experience the joy of waking up in Waihee. HILT’s Malama Aina Camping Program recently provided me with a rare opportunity for total mission immersion. I set up camp the night before our annual Hoolaulea, an event that honoring the community volunteers who embody HILT’s mission to know, protect, and steward our lands. Waking up in Waihee the next morning, generations of community members – human, plant, and animal – brought HILT’S mission to life. First, I greeted a Maui outdoor artist, who shared my appreciation the “green post” site at the end of the camping area. While he recreated the vivid landscape on canvas, the kupuna of Waihee welcomed us all into their sacred homelands, naming the generations of Waihee’s stewards, with every breath connecting us to a time before recorded Hawaiian history. Dr. Scott Fisher, HILT’s Associate Executive Director of Conservation (in his natural habitat) treated us to his beloved Talk Story on the Land guided hikes, tracing the impacts of centuries of human use - sometimes harsh, but sometimes incredibly nourishing. Walking and learning these new lands should have felt foreign, but I felt a sense of familiarity in the natural, undeveloped seascape of its endless ocean waves - waves that you could watch, surf, swim, fish, or otherwise enjoy freely. I also felt the now familiar pull of my orders: advance the mission. Throughout my career, I have helped inspirational institutions advance many worthy causes. Today, I am grateful for the chance to advance a mission that is truly extraordinary, far-reaching, and soul-affirming. I am grateful for the opportunity see with my own eyes, hear with my own ears, and feel with my own skin the richer way of life that is possible when we act to know, protect, and steward the lands that sustain us. Most importantly, I am grateful for the grave responsibility and great joy that comes along with advancing such a deeply regarded mission. As I begin to understand and appreciate the mission that we all share in Hawaii - to protect the lands that sustain us for generations - I thank my lucky stars for HILT, for the founders, donors, members, partners, and friends who have contributed to this soul-affirming mission, and for the lands that continue to inspire us. Mahalo nui loa for your support – past, present and future – and for the honor to advance our shared mission to protect these special, happy places. The Hawaiian Islands Land Trust has several land projects in the works we hope to close by the end of 2018! We also have a growing number of potential projects and partnerships we are working on to build a strong pipeline of conservation projects protecting Hawaii’s most special lands and natural resources. HILT has been working with Waikapu Country Town to acquire a conservation easement. This deal ensures the permanent protection of over 900-acres of central Maui’s prime agricultural lands currently being cultivated by small diversified farm operations. The terms of the agreement are under negotiation and we hope to close on this project soon! 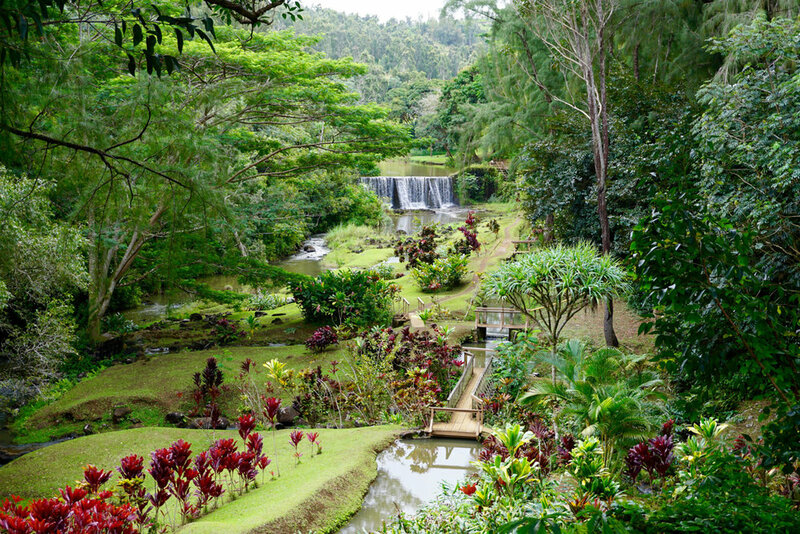 HILT has been finalizing the terms of a conservation easement with the landowners of the popular Wai Koa Loop Trail in Kilauea, Kauai to preserve public access to the scenic trail and destination areas including the historic Stone Dam. HILT is collaborating with The Trust for Public Land and MAO Organic Farm in the acquisition and protection of 21 acres in Waianae to expand MAO’s popular farm and youth leadership program. Funding for the acquisition is being secured. The land trust is working with a landowner in Hilo, Hawaii to acquire and protect over 1,600 acres of native ohia and koa forest including habitat for our native forest birds. Due diligence is currently being conducted on this project. If there ever was anyone who epitomized those words, in our opinion here at HILT, it would be Peter Merriman. The restaurateur, entrepreneur, philanthropist, and all-around-great-guy, has been an important part of the HILT ohana for a long time. His commitment to land conservation and Hawaii’s sustainability will be honored on September 22nd at HILT’s E Malama Aina Kakou benefit event where he will be named our 2018 Kahu o ka Aina. We look forward to celebrating Peter and his contributions to Hawaii. In preparing for the event, Peter shared with us one of the reasons he’s a HILT fan. George Plimpton has always been one of my idols. Plimpton was a “participating journalist.” He conducted orchestras, played for a few weeks in the NFL and did a few acting stints so that he could write about the experience. These are special moments for me, when I see the best of the best, engrossed in their passion. This was my feeling recently upon entering the HILT Maui office in Iao. Parked on the kitchen counter were four PVC tubes, about 3” in diameter and 5 feet long, closed at each end. Upon inquiring with Dr. Scott Fisher, HILT’s Associate Executive Director of Conservation, I was treated to an in-depth explanation of the intricacies of core samples! This is the bomb! Above from left to right: James Crowe, HILT’s Land Steward, extracting the sediment samples; the sediment collected; and a slide image of pollen collected from one of the sediment samples from Waihee. 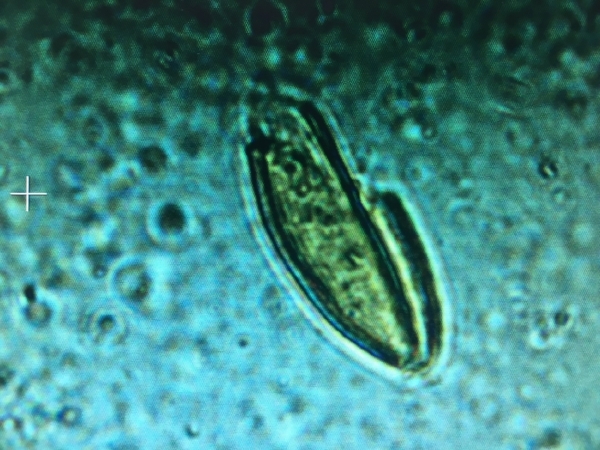 The pollen is from Pritchardia (Loulu) probably dating to before humans arrived on Maui. That’s my version of George Plimpton. Getting to hear Scott wax on the history of Hawaii, her people and ecosystems, and how he applies science to these areas of interest. The HILT website has the schedule for Talk Story on the Land. Whether you were born here or have just arrived, you’ll be certain to learn something. You’ll feel more connected to the land as well. Do your own George Plimpton thing and be certain to attend a “Talk Story on the Land”. Even if you have already been to the Waihee Preserve or Nuu, go again. This time you’ll get to tag along with HILT’s Mickey Mantle or Willie Mays as he expounds the beautiful surroundings in a way that can be found no where else. If you are like me, you pay attention to the places you shop and the products you buy. Happily, we are not alone. 87% of consumers today flex their economic muscle by supporting companies whose values are closely aligned with their own. We “buy local” and support small businesses, we opt for products with less packaging, we choose products with a “give-back” message – and retailers are paying attention. Companies are not naïve to consumers’ desire to be responsible with their buying practices. They have adjusted by adopting Corporate Social Responsibility (CSR) as a strategy to grow profitability by increasing brand loyalty and implementing cost-saving innovations. Companies use an accounting framework called the “triple bottom line” that measures business performance on a broader scale than just the profit margin. It examines and monetizes a company’s impact on people, the planet, and profitability. Over 90% of G250 companies offer CSR reports – a testament that CSR is here to stay. In a series of Freakonomics podcasts, economist Steve Dubner recently discussed CSR. One facet of CSR specifically resonated with me: CSR may further increase a company’s revenues by attracting more qualified, productive, and loyal employees. I see the reality of this trend every day in my work with representatives of successful local companies whose values align with our own. As we work to develop mutually beneficial partnerships with these companies, I have been enthralled by the drive, commitment and professionalism that their employees add to their corporate philanthropic mission. For example, you could walk into any one of Peter Merriman’s restaurants and every employee, from busboy to VP, will actively embody the Merriman’s “do the right thing” motto. The same goes for the giving cultures created by local business partners like Chad Goodfellow’s Goodfellow Bros, Danny Boren’s Skyline Eco-Adventures, and Tim Lara’s Hawaiian Paddle Sports. I’ve seen, through countless volunteer days, that our local employees are the vehicle by which these companies not only talk-the-talk, but walk-the-walk. Hawaii Life Real Estate Brokers is one of the fastest growing real estate companies in Hawaii. Again, good companies attract good people, and co-founders Matt Beall’s and Winston Welborn’s philanthropic drive, in my opinion, inspire a holistic dedication to the corporate mission. What a company stands for appeals to customers and employees, alike. Proactive CSR practices and communications are crucial to remaining competitive across markets. The culture of philanthropy and malama aina (caring for the environment) is strong in Hawaii nei and HILT is proud of, and grateful to, our corporate partners for taking a stand. These alliances create rippling effects throughout our communities, allowing HILT’s conservation message to reach people we couldn’t have touched on our own. We try to do good here at HILT, and that extra layer of support from our partners help us to do even better. Mahalo piha to our partners and their employees, and even more to our communities who continue to hold us all to the triple bottom line. If you’d like to learn more about HILT and our partners, visit our Corporate Giving page, which discusses a variety of ways in which we work together to achieve our shared mission of land conservation.